To form the ultimate Stroker Kit use with BC Crankshafts with the corresponding connecting rod and piston combination. The Brian Crower stroker kit delivers a system matched setup that installs correctly the first time. 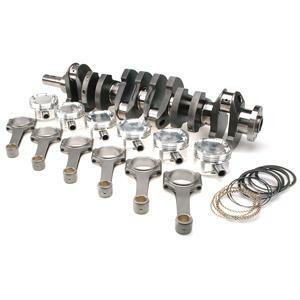 Although specific differ from kit to kit, you can be sure each Brian Crower Stroker Kit incorporates a larger stroke, steel billet crankshaft – not a reworked OEM crank, custom forged aluminum pistons, premium alloy wrist pins, full ring pack, 4340 steel billet connecting rods w/ARP fasteners, and ACL Bearings. All this equals a fully balanced system, ready to install, for some big time power and torque gains.